Asure ID Exchange includes powerful integration, enrollment and encoding modules to ensure a quick and seamless gateway to other existing database sources, whether installed on a PC or a Windows® 8 Pro Tablet. The iDIRECTOR® encoding and management module improves smart card development and deployment by enabling you to personalize the card graphically and electronically in one seamless process. Asure ID Exchange also includes a laser configuration module for simplified set-up and maintenance of the HDP8500LE Laser Engraver. Together, you’ll have everything you need to design and populate a card with a couple of clicks of the mouse. 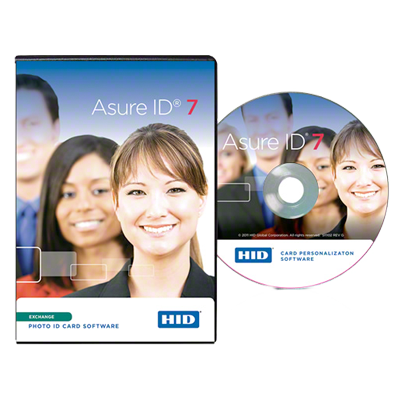 Improved User Interface - Asure ID Exchange has a user-friendly interface has a similar look-and-feel to the familiar Microsoft® Ribbon, allowing you to design and manage the creation of sharp photo IDs with minimal training. Databases Demystified - Asure ID Exchange comes with an internal database but utilize the configurable Live Link plug-in to easily print cards from a common database with real-time data exchange to Oracle®, MySQL®, Microsoft® SQL Server®, and Microsoft Active Directory/LDAP. iDIRECTOR - In combination with Asure ID Exchange, the iDIRECTOR module allows you to quickly and easily manage card memory, load multiple smart card applications, and graphically personalizes smart cards such as iclass® Seos® in one seamless process. iCLASS SE® Open Encoder Platform Support - Asure ID Exchange also includes support for HID Global’s iCLASS SE encoder platform, enabling your users to create, encode (read/write), and manage physical access control solution (PACS) credentials in a single step, streamlining ordering, inventory management, and issuance processes. Robust Reporting Suite - Asure ID Exchange enables you to filter, sort, and group data as needed to build custom reports that meet the needs of your business. FARGO® HDP8500LE Laser Engraver– Using Asure ID Exchange, you can print, encode, engrave and laminate your secure credentials within a single, unified card template, saving you critical production and delivery time. Physical Access Control Integration - Asure ID Exchange is tightly integrated with over 25 leading access control systems, making it exceptionally easy to register your PACS credentials directly from the software and reduce the number of applications utilized during the issuance processes.